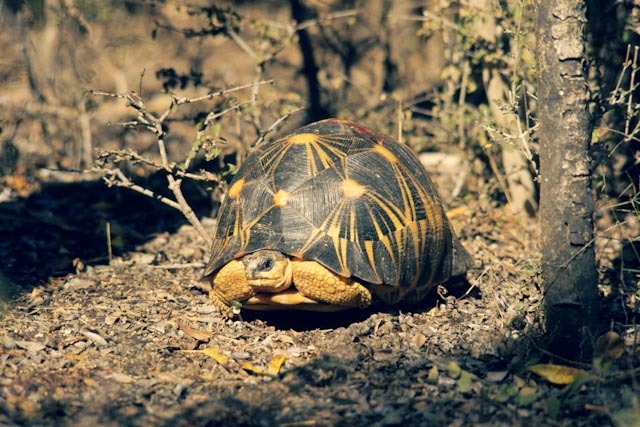 The radiated tortoise, Astrochelys radiata, is found nowhere in the world except southern Madagascar but its population has been tragically decimated in recent years due to international trafficking. As a result, radiated tortoises are a particular focus of conservation efforts and intensive monitoring at Bezà Mahafaly. It is encouraging to report that they remain abundant in the Reserve, and the population includes many young. A total of 267 individuals have been marked, weighed and measured, many of which have been encountered again in the forest. Each individual’s age is estimated by counting annual growth rings on one of the scutes on its carapace. The most “senior” member of the population known so far is estimated to be more than 30 years old. Bezà Mahafaly is a significant haven for this critically endangered species and, with constant vigilance, we are determined it will remain so.